Arad was an ancient Canaanite city lying in the south of modern Israel, between the Negev and the Judean wilderness. Well-preserved ruins of the city, now a national park, go back to about 2600 B.C. 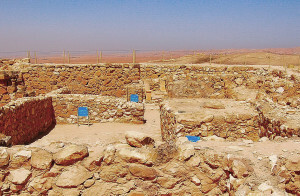 The Arad ruins are most famous for their suggestion that Jewish residents of ancient Israel worshipped both God and his wife. According to the Bible, Moses initially tried to lead the Israelites into their promised land in Canaan from the south, through the area around Arad. The Canaanite King of Arad aggressively resisted their entry, capturing some prisoners. Because of this interference with what they saw as God’s mandate for their occupation of the land, the Israelites promised God that if he allowed them to enter Canaan they would destroy the Canaanites and their cities. When the Israelites eventually entered Canaan from the east, crossing the Jordan River just north of the Dead Sea, they proceeded to do precisely that, starting in Jericho. In about 1200 B.C., the Israelites built a fortress at Arad near the original Canaanite city. In 1962, archeologists unearthed a temple within the fortress, dating to the time of King Solomon and built to honor Yahweh, the invisible God of the Israelites. Because the temple in Jerusalem has not been found, this is the only Jewish temple from the Biblical period ever uncovered. Like the Jerusalem temple described in the Bible, the Arad temple had a large altar of undressed stones in the courtyard. Like the temple in Jerusalem, the Arad temple had a Holy of Holies surrounding a four-horned altar for honoring Yahweh once year by burning incense. But unlike the temple in Jerusalem, the Arad temple encompassed a second incense burner, smaller than the first. Arad’s Holy of Holies also included two standing stones, apparently representing two deities. Scholars believe Arad’s second incense burner and second standing stone probably honored Asherah, the wife of the supreme Canaanite god “El” whose name is reflected in many Jewish names, including Israel. The Israelites could destroy the Canaanite cities. They could not so easily destroy the Canaanite belief that every god needs a wife.